That point is driven home in Spectrem’s new study Evolving Investor Attitudes and Behaviors, which examines how investors with a net worth between $100,000 and $25 million feel about matters that involve investment strategies as well as matters that exist outside of the financial markets. There are simple differences between the two segments based on working status, such as their use of a personal financial advisor (65 percent of retired investors to just 51 percent of working investors). But the revealing information comes when investors were asked about their personal and national concerns. Simply put, retired investors have fewer personal concerns than do those investors who are still working. Much of it has to do with the fact that working investors tend to be younger, with younger children, and without the financial certainty that comes with accepting retirement as the next stage of your life. For example, 52 percent of working investors worry about maintaining their current financial position. Only 44 percent of retired investors have that concern (while noting that the concern over maintaining one’s current financial position does not completely disappear upon retirement). Retired investors are much less likely to be worried about financing anyone’s education. For working investors, concern over paying for a child’s college reaches 39 percent of investors to just 10 percent of retired investors. Concern over paying for a grandchild’s college education is near equal at around 25 percent of all investors. So what replaces the concern over job security and college costs for retired investors? Their personal health and the health of their spouse is the answer. Sixty-two percent of retired investors worry about the health of their spouse and 57 percent worry about their own health, compared to 50 percent of working investors worried about their spouse’s health and only 46 percent worrying about their own health. With fewer financial concerns, retirees have time to consider the big picture, and are much more likely to have concerns over national issues than do working investors. Eighty-nine percent of retirees worry about the political environment in America, 79 percent worry about the national debt, and 80 percent worry about government gridlock. In all cases, that is more than a 10 percent greater level of concern than among working investors. 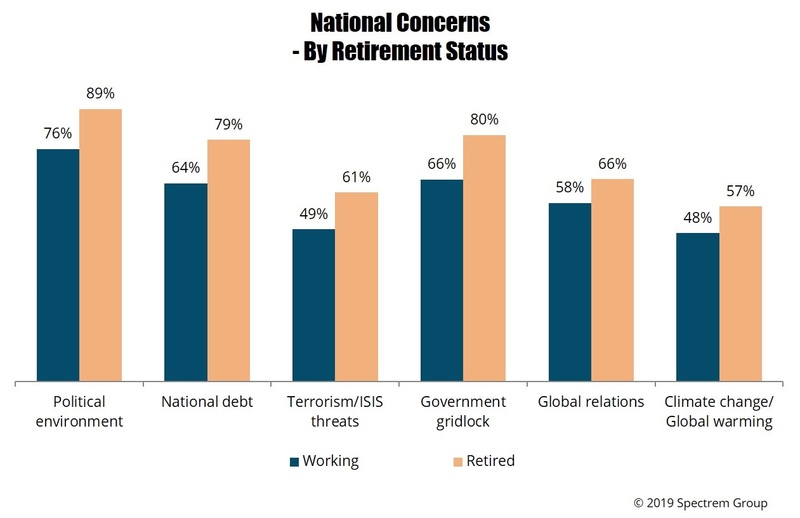 Talk about big picture concerns – 66 percent of retired investors express concern over global relations between the United States and countries from around the world. Only 58 percent of working investors have time to consider that all-consuming issue. Advisors need to know what is causing his or her client’s furrowed brow. Concerns may not be eliminated, but they can be alleviated, especially if they have a financial basis. Advisors can assist in decreasing concern over financial issues, but only if the investor is willing to share their level of concern. They are more likely to share their concerns if they are asked about them. So, don’t forget to ask.